Of particular note in this postcard is the large space where the East Church Hall / CAYP Centre now stands. There also seems to be a gateway leading into Church St at the east end of the wall. 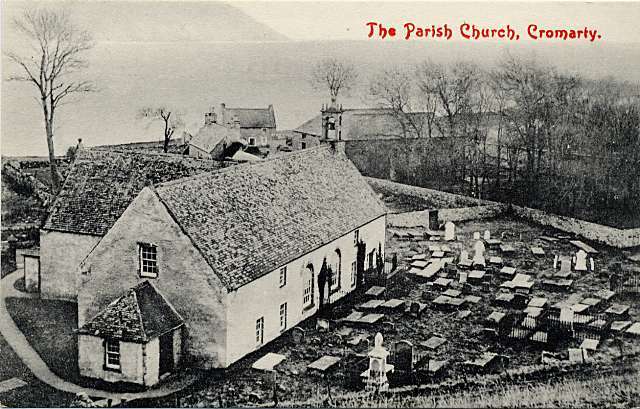 You know, this postcard looks very similar in style to those photographed and published by Donald Fraser of Cullicudden. I've been gathering all the images by him and giving his life story on the Kirkmichael website at www.kirkmichael.info/DFraserPhotographer.html and I wonder if it is by him. If so, it is likely to have "D. Fraser, Cullicudden" on the reverse of the card - I don't suppose you have the reverse? Or Clem's email?